If you recall our story of the Audi A6 Special Edition, this was a limited edition A6 with several new features on it. Several of the features from this tickled down to the A6 as well. We lay our hands on the new 2.0 TFSI engine on the A6 and share our first-hand experience of this luxury mid-size sedan from Audi. Read further as we elaborate our story. Audi has carried forward its design DNA on the A6 as well. It has front grille has a lot of similarity to the A8 grille except for the fact that it doesn’t get the chrome slats to make it look three-dimensional. The headlamps are sleek and the lower part of the bumper is blacked-out. The side profile somewhat resembles a sports back, but it isn’t completely it as it has to have sufficient head-room for the rear passenger, and if at all you need a fastback there is always the A7 on sale in the same showroom. The side-profile resembles any other Audi, especially the DLO (daylight opening) that looks like a smaller A8. The A6 does feel wee bit longer and somewhat closer in size to the A8. The interiors of the A6 are very much Audi-like, and they are very lounge-like. The fit and finish is first-rate and the styling is a meld of contemporary and class. The steering wheel is a typical Audi four-spoke with all the controls on it. 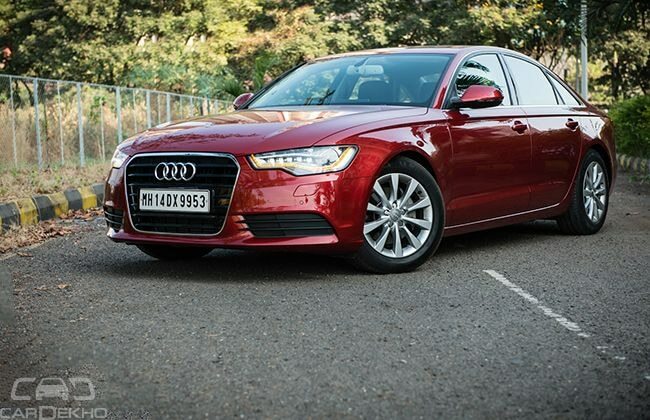 The A6 comes loaded with several frills that one will expect on the mid-size luxury sedan. The instrument panel has wooden and brushed aluminium panels that add on to the styling. The interiors of the A6 are spacious too. The front row seating is brilliant as the large and soft seats pamper you with the rich leather-bolstered seats. There is sufficient back; thigh and side support in the A6 and you can sit low-slung as well. The rear seats are comfortable too as they provide sufficient thigh support and is extremely comfortable as well. You can adjust the co-driver’s seat from behind without even getting up, as there is this new feature that has been added to the A6. There are rear AC vents behind the armrest and even on the B-pillar. The boot also is large and gobble luggage for the weekend. The Audi A6 comes with three engine options, one is the petrol and other two are diesel. The petrol is a 2.0-litre turbocharged and is a four-cylinder engine. This produces about 180bhp of power, which has been detuned from 211bhp. However, it doesn’t feel underpowered at any point of time. This is because it is now bolted to an eight-speed self-shifting transmission than a seven. The power produced by this engine is good and it doesn’t feel underpowered despite this being the smallest engine. This engine powers the front wheel as Quattro is available only on the 3.0-litre V6 diesel. Audi has ensured that the power from this mill is good enough and actually the eight-speed box helps to spread the torque more evenly. The shifts are smooth and there isn’t much of jerk when you downshift as one experienced on other DSG boxes. The petrol mill isn’t noisy and even the NVH levels are fairly low. However, we wish that the engine revved a bit more freely. The mid-range is strong when the turbo kicks in and it continues to pull until 4500rpm with ease. Mercedes-Benz vehicles are known for their comfort, while the BMW are driver’s car. Audi falls in between, as it is good at both. The ride suppleness of the A6 is good and it doesn’t even feel stiff or too soft. The suspension does a good job of absorbing the bumps. Smooth roads, bad roads the ride is very much pliant. Speaking about the handling, we are again impressed. There isn’t much of under-steer and despite being a front-wheel. Push it around a bend, and the tyres will obey your command. The steering wheel is also good and you can sit low and drive like racer boy too. It isn’t heavy or extremely light, the steering is perfect and it weighs as the vehicle gathers speed. The A6 is definitely a good choice for mid-size luxury sedan. People are generally brand loyal more than value for money. Audi has done a great job with the A6 and you will have no regrets if you pick the A6.